Yaxley manager Ian Benjamin is expecting a tough FA Vase battle at home to London Colney on Saturday. 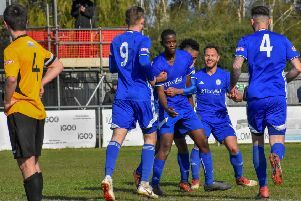 But he’s happy that the Cuckoos tackle a tough tie on the back of a 6-3 win in the United Counties Premier Division over Oadby when Dan Cotton bagged a hat-trick and Jon Stead struck twice. Benjamin said: “That was a big boost for us and we will need to take that form into the game against London Colney. Holbeach United are also in FA Vase action at Walsall Wood. They warmed up with an excellent 2-1 win at Kirby Muxloe in the United Counties League Cup last weekend. Jake Clitheroe scored both goals. Peterborough Sports are now 11 points clear at the top of United Counties Division One after coming from behind to stretch their perfect winning record to 14 games with a 2-1 home success over in-form ON Chenecks. David Cobb and an own goal in the second half secured the win and Sports will expect to make it 15 straight wins at lowly Woodford United this Saturday.